Left to right: Ross Ward (NIRI), Dave Edmondson (NHSBT), Chris Fowler (NIRI), Andrew Bailey (Macopharma). 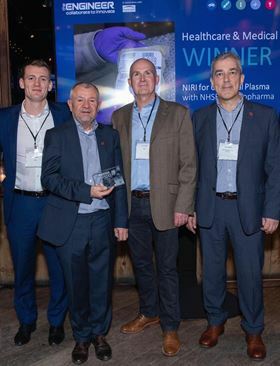 The Nonwovens Innovation & Research Institute (NIRI) has led a consortium of medical specialists to win the Collaborate to Innovate (C2I) Award for its pioneering Sanguis universal plasma project, which could save the NHS around £20 million. The Sanguis universal plasma project combines textiles and chemistry in a project that could transform blood transfusion services and help save lives. Currently, only blood group AB plasma can be given to anyone, but only 4% of the UK population has this blood type, leading to constant pressure on supply. Working in partnership with NHS Blood and Transplant (NHSBT) and Macopharma, the Sanguis project has developed a process to remove ABO antibodies from donated human plasma, creating universal plasma which can be used to treat people of any blood type. Key to the process is a fabric-based immunoadsorption filter, developed by NIRI. The full story behind this win appears in the November/December issue of Filtration+Separation magazine. Please click here to register for your free copy. The article appears on page 24.